Gentoo penguins (Pygoscelis papua), Antarctica. 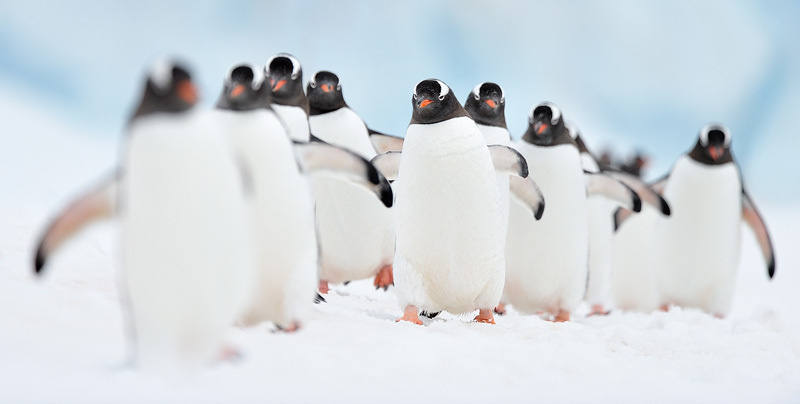 They are closely associated with the Adélie penguin and the Chinstrap penguin. Gentoos reach a height of 51 to 90 cm (20 to 35 in), making them the third largest species of penguin after the two giant species, the Emperor penguin and the King pinguin. They are the fastest underwater swimming penguins, reaching speeds of 36 km/h (22 mph). The IUCN Red List lists the gentoo as 'near threatened'.